We rarely eat out, mainly because with three kids in tow, it can be quite difficult to have a nice and quiet sit-down meal. Our kids just can't sit still. However, last weekend, I managed to "persuade" my sister to babysit (okay, she was nice enough to take the hint) while G and I went out for lunch. It was a tough choice, but we finally settled on this restaurant called Red Chilli Sichuan, since it's a place that we probably won't be bringing the kids to in the near future. Naturally, all the dishes we ordered were spicy and had more chilli in it than I've eaten in a year. Most of the food featured on the menu either had a tonne of sichuan peppercorn in them or were cooked with a tremendous amount of chilli. 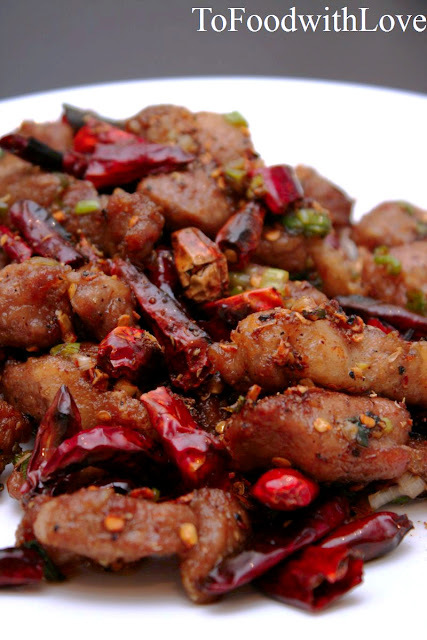 We ordered this diced chicken dish which was just that - little bits of deep-fried chicken cubes buried under a mountain of crispy dried chillies, not to mention the lashings of Sichuan pepper and chilli seeds in that dish. It was a tongue-and-mouth-numbing experience, but delicious nonetheless. The cold bean noodle in sour sauce provided some cool respite. (Hmm...I wonder if dentists in the province of Sichuan used Sichuan peppercorns as anaesthetic back in the old days....). Combine meat with marinade and leave for 2 hours. Heat oil in wok. Lighly coat meat with potato flour (or cornflour) and deep fry for 2-3 minutes till golden brown. Drain on kitchen paper. Heat up 1/4 cup oil in a clean wok and fry garlic and ginger, then add spring onions and dried chillies (together with the seeds) and fry for about a minute. Mix in the hoisin sauce and red wine vinegar. Add lamb and toss in wok with the salt, sugar, black pepper and Sichuan pepper. Dish up and serve with steamed white rice.